With expertise in EMI/RFI shielding products development to be utilized in military and commercial applications, the engineers at MAJR Products provide EMC compliance and electrical safety grounding equipment. The grounding and conductive washers produced by MAJR Products are designed and manufactured to suit the needs of your specific application. EMI grounding washers are designed to ensure positive electrical contact and EMC assurance for electronic equipment and shielded enclosures. MAJR Products’ extensive EMI/RFI shielding equipment development experience led us to design our knit wire mesh grounding washers with a goal of making them both resilient and effective. The all-metallic wire mesh grounding washers can be supplied in various metals and alloys (typically of tin plated steel, Monel, silver plates brass, or aluminum). The material used will depend on the needs of the specific application, such as exposure to extreme temperature or chemical conditions. The length and thickness of the wire mesh knitted stocking prior to being compressed and the inner and outer diameters of the washers themselves will also vary, designed specifically to meet the density and resilience requirements of the project. EMI/RFI wire mesh grounding washers by MAJR Products are designed to enable structures to achieve high EMC shielding standards and to meet FCC and UL electrical safety assurance standards for commercial equipment. 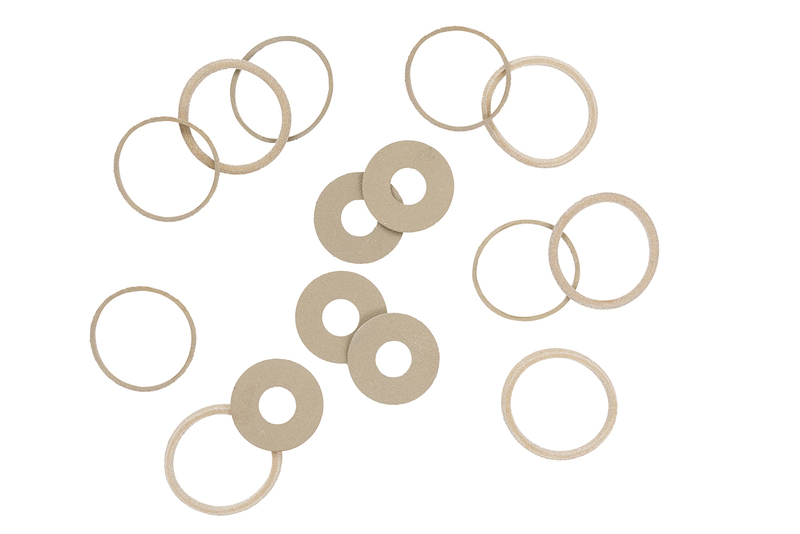 Our conductive elastomer washers are designed to provide a snug fit around a shaft or rod in order to eliminate the possibility of it acting as an antenna to radiate or pick up unwanted electromagnetic noise. The EMI/RFI conductive elastomer washers are manufactured with silicone, fluorosilicone, or EPDM, depending on the environmental aspects of the application. Conductive particles in the elastomer are usually of a silver plated metal or glass, though other fillers may be used, if needed. Each washer is either die or flash cut to exact specifications and can be supplied in various O.D., I.D., densities and levels of thickness to satisfy the requirements of the application. The conductive elastomer washers also act as a shock absorber, reducing mechanical stress, in addition to enabling electrical grounding. Popular applications include connector shielding to a signal or power panel or electronic equipment. See how MAJR Products can solve your electronics shielding equipment needs. Contact us for additional product information, free sample products, or to receive a quote on EMI/RFI wire mesh grounding washers or conductive elastomer washers.